Regardless of where you live, I’m a firm believer you can take advantage of some of the many benefits vertical gardening offers. The advantages of vertical gardens really come into their own in micro garden spaces where options are very limited. As most people live in urban areas, clever design ideas are a key to make the most of the space you have. So if you’re not yet growing up, here are 12 reasons why you should! 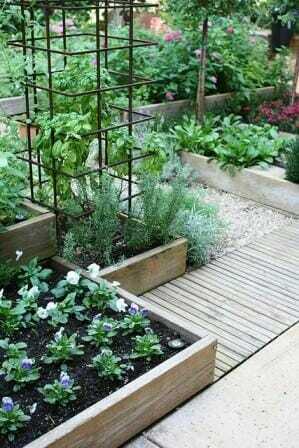 When you garden vertically, you can ncrease your growing space especially when it is at a premium in a very tiny area. 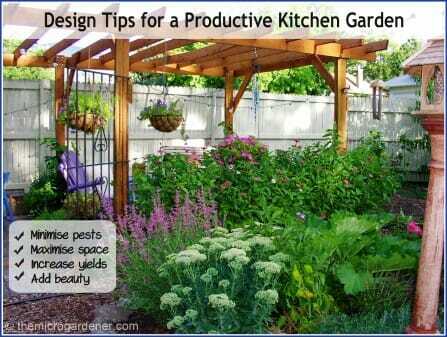 This kitchen garden has effectively used techniques like stacking raised garden beds and growing climbing veggies up trellises. These increase productivity and make maximum use of space. Some vertical structures like arbors, arches, pergolas and gazebos help create the ambience of an outdoor garden ‘room’. A vertical garden structure helps to focus the eye on the mystery beyond. Overhead vertical garden structures also give a sense of height and depth to an otherwise small space. An arbor at an entrance or on a pathway can frame a space, invite you further into the garden and provide an appealing vertical structure to add colour and character. Disguise unwanted views, nosy neighbours and create more privacy. For example, grow a green wall to screen a boxy air conditioner and unattractive garden structures like sheds or compost bays. Plants are easier to reach by bringing them up off the ground. Gardening vertically makes fertilising, watering, pruning and harvesting much more convenient and saves your back. This micro garden space takes advantage of stacking plants with a step ladder and clustering pots on the ground and on repurposed chairs. When you raise your plants up off the ground, this improves air circulation. 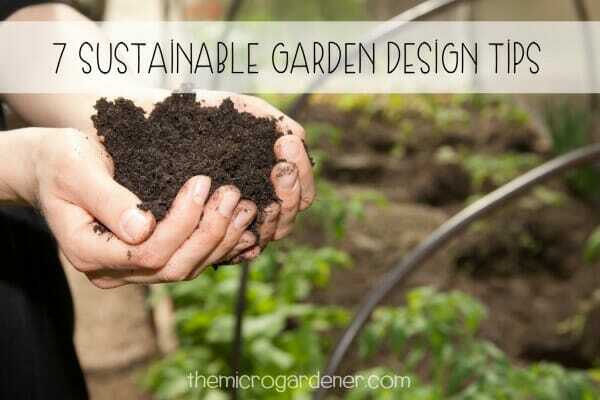 This is a simple strategy for healthier plants and less pest or disease problems. You can also minimise plant damage due to pets or wild animals digging up gardens on the ground. 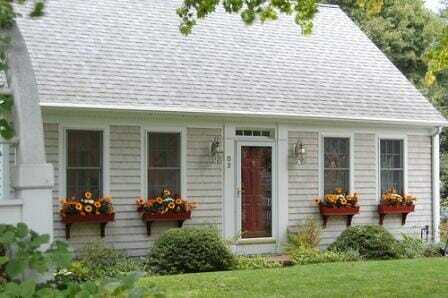 Improve the beauty of your garden and increase ‘curb appeal’ by adding character, variety, structure and colour. Create ‘eye candy’ by planting at eye level with vertical garden structures like hanging baskets and window boxes. Add street appeal with window boxes – repeating the same colours here really gives a WOW factor and helps brighten up the exterior. 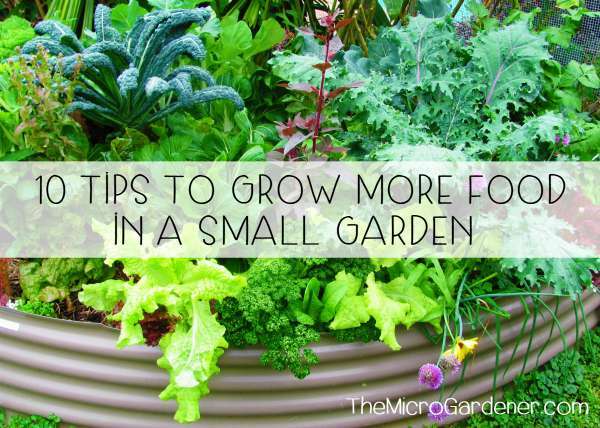 Expand the number and kind of plants you can grow in your garden. Some vegetables like pumpkins that grow on vines can take up a lot of personal space. However, you can train dwarf varieties to grow up and over a trellis in a very compact space. You can garden vertically with many climbers including cucumbers, tomatoes, passionfruit and melons. You can enjoy a more productive harvest of food crops by growing up and using vertical gardening techniques like espalier. Espaliered trees take up minimal space but increase fruit crop yields significantly. 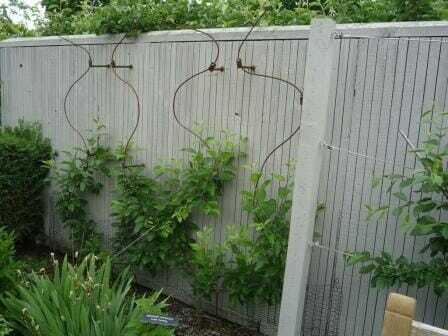 Here these apple trees from the Minnesota Landscape Arboretum in Chanhassen are growing in a serpentine shape and on another fan shape wire trellis on the right. You can use vertical gardens to soften otherwise hard or stark building and landscape surfaces. Camouflage with living green walls and other vertical design features. 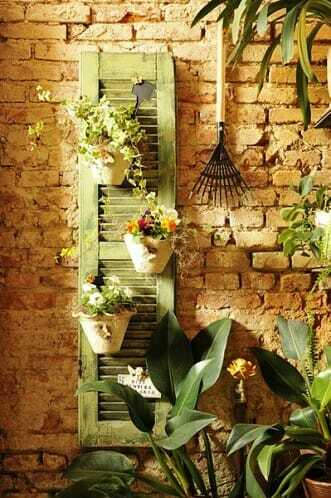 A repurposed window shutter forms the structure for a simple but stylish vertical garden. 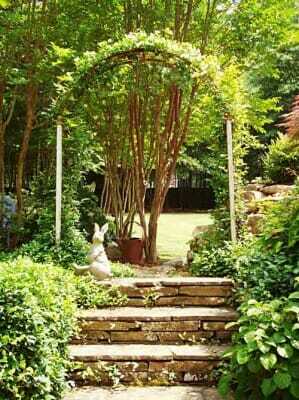 Create an entrance, backdrop or framework; define boundaries and edges; and provide a sense of enclosure or seclusion. 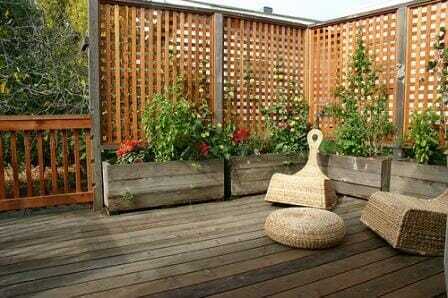 This compact deck area cleverly screens out neighbours with vegies in planter boxes and lattice screens. 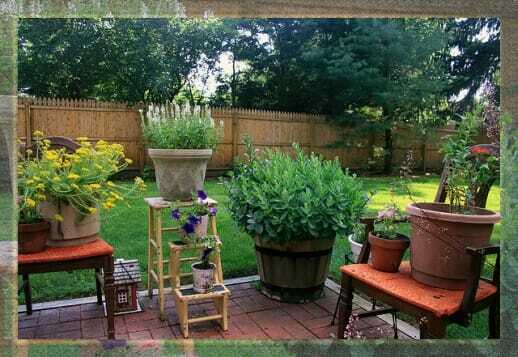 It makes an inviting, functional and edible garden space while not compromising on the entertaining area. You can insulate your home from heat, air pollution or noise by designing in a living natural shield. This can help to regulate temperature by cooling and shading an area. You can also create a microclimate by adding a vertical structure like a tepee, trellis, pergola, arbor, arch or A-frame that will provide shade below. 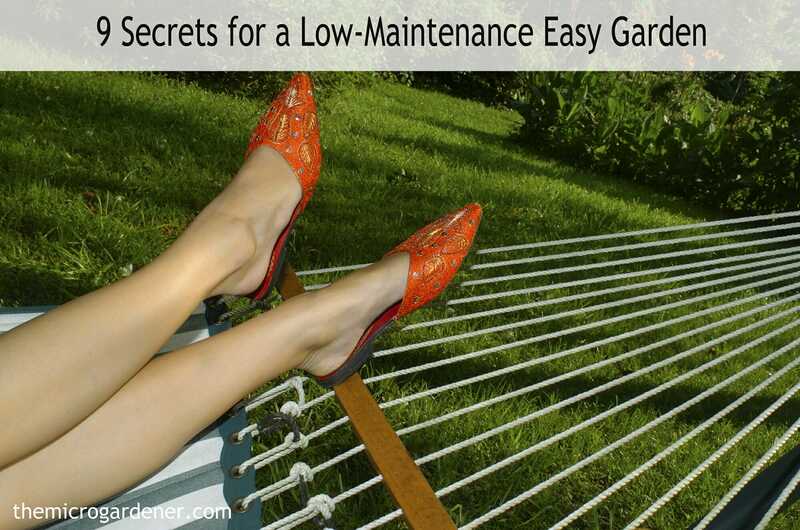 The cooler spot under the support will suit shade-loving plants and sun worshippers will thrive climbing up and over so you get the best of both worlds. 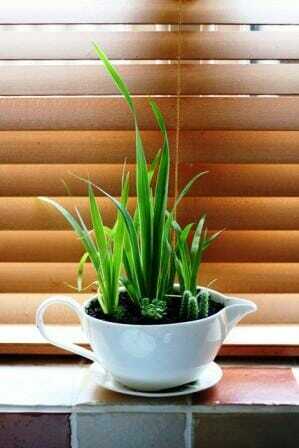 Research has revealed that plants improve both indoor and outdoor air quality by removing harmful VOCs (volatile organic compounds) and absorbing pollutants. Houses have been found to have consistently poorer air quality indoors than out, even with external pollution. So, growing plants vertically even in compact spaces like windowsills, balconies, front entrances and hanging in aerial space will make a BIG difference to your health. This was an awesome lemon juicer made by Wedgwood. Sadly, it broke whilst juicing a lime but has now been recycled into a plant pot instead on the kitchen windowsill. Affiliate Links: Your support of this site is appreciated! 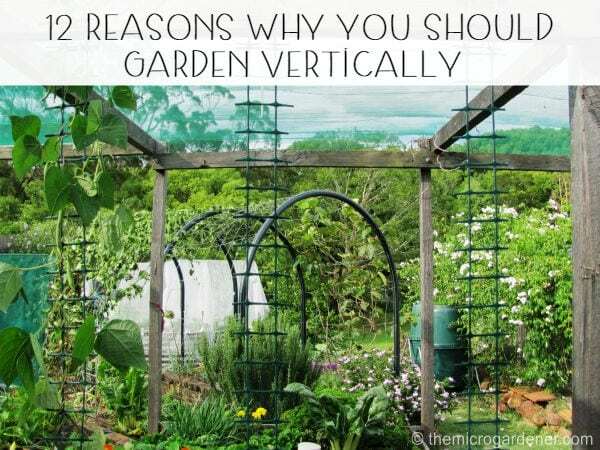 I hope these 12 vertical gardening benefits have helped inspire you to start gardening vertically! Check out the many tips and photos in other articles for more inspiration. 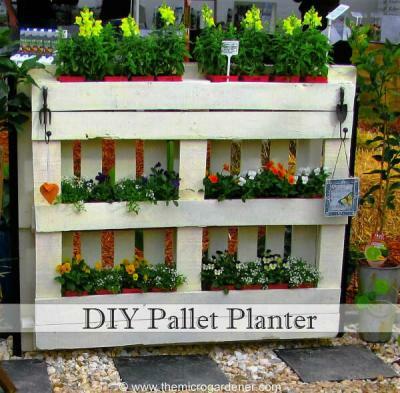 Related Articles: Add Space with Creative Vertical Gardens: Part 1 and Part 2; and 15 Helpful Design Tips for Vertical Gardens. You can find even more Clever Design Ideas in the Container Gardening category. Please share and encourage your friends to join my free Newsletter for exclusive insights, tips and all future articles. © Copyright Anne Gibson, The Micro Gardener 2013. https://themicrogardener.com. All rights reserved. Some links within this article are affiliate links. I only recommend products or services I use personally or believe will add value to my readers. If you purchase a product via an affiliate link, I will earn a small commission. There is no additional cost to you. It’s a way you can support my site, so it’s a win-win for both of us. You directly support my ability to continue bringing you original, inspiring and educational content to help benefit your health. Thanks! Please read my Disclosure Statement for more details. I have never heard of gardening vertically before, but the idea of obtaining a higher crop yield is definitely attractive. However, does this apply to all crops? I guess I’m just curious if the tomatoes in my garden, as well as the carrots, would be just as responsive to the vertical method. Vertical gardening can be helpful to maximize space, reduce some diseases in plants with better air circulation and makes harvesting easier. Climbing tomatoes or any tomato variety that needs staking or trellis support are ideal candidates for a vertical garden. Carrots on the other hand are root crops and don’t need any support so they wouldn’t benefit. Climbing beans, cucumber, pumpkin, squash, peas etc would all work well. I love the photo you provided under define, a space. That is the kind of vertical garden that I would love, for our new backyard. We are fixing it up to hopefully make it an area that we are drawn to. That is such a great idea to double purpose the wall to keep the neighbors from seeing in and where the plants can grow vertically. Thanks Fran – and for sharing your microclimate example. How wonderful that you solved multiple problems this way. There are so many ways to use plants in layers in combination with vertical structures to create protected zones. Keep up the great work! Hi Eleanor there are lots of articles on this website with more information about different types of vertical gardens you can check out that hopefully will inspire you with some ideas of the kinds of structures that may be suitable in your situation. You’ll find them in the Vertical Gardens category. I suggest you start with Add Space with Creative Vertical Gardens Part 1 and Part 2 then 15 Helpful Design Tips for Vertical Gardens. Hope this helps! I am pleased to find an image of my serpentine apple espaliers on your website. You might want to say that they are from the Minnesota Landscape Arboretum in Chanhassen, Minnesota. They are fully grown and making fruit–mostly for the squirrels to grab. I am glad you found them. Thanks Katherine. Great to hear from you and identify the fruit trees in question. Have updated with their location. Great work – they look gorgeous! Appreciate your feedback. Any tips you can offer Micro Gardener readers on espalier?